This page contains information about a trapeziectomy. Further questions should be directed to your doctor or other health care professional. The cube-shaped trapezium bone can be found in your wrist at the join with your thumb. 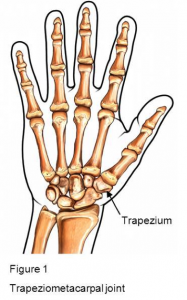 This is the trapeziometacarpal joint. Arthritis has many forms, but osteoarthritis is the most common and occurs where there is steady deterioration at the site of a joint. In the normal course of things, osteoarthritis wears the cartilage covering the joint surface away. With no protection, the bone below easily becomes damaged and this causes pain, inflexibility and feebleness. Surgery can help with pain relief and improve mobility in your thumb. Immobilising the thumb with a splint can help; a steroid injection at the joint site can also relieve pain. An artificial joint made from metal and plastic can replace the joint. A procedure called arthrodesis is often offered to young people who are always on the go. This involves screwing the thumb bones together. This is a permanent adjustment. The procedure takes between one and one and a half hours to complete. Several anaesthetic options are possible for this procedure. A small incision will be made at the back of your hand at the base of your thumb to access and remove the trapezium. One option will be for the surgeon to build a ligament from the tendon running over the trapezium. The ligament will connect the thumb and the wrist. Thumb movement can be prevented by the pain caused by osteoarthritis so that your movement is restricted. Pain relief and mobility of the thumb are direct results of a trapeziectomy. We look forward to hearing from you to discuss your needs and see how we can get you the best treatment, quickly and affordably.